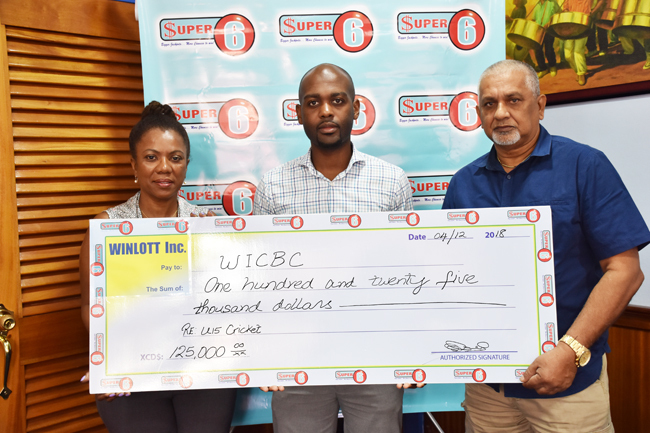 St. George’s, Grenada – December 6, 2018 – Windward Islands Lottery (WINLOTT Inc) will once again be joining forces with the Windward Islands Cricket Board of Control (WICBC) and throwing their corporate support behind the WINLOTT Inc WICBC Under 15 Tournament to be hosted in St. Lucia, December 10-17, 2018. Winlott Inc which is owned by the four lotteries in the Windward Islands will provide sponsorship in excess of $150K for tournament’s expenses, covering uniforms, travel, accommodation, meals, trophies and prizes. A brief handover ceremony was held on December 4, 2018 at the National Lotteries Authority headquarters in Kingstown, St. Vincent, where Executive Director, Allison Thomas presented the cheque to Director, WICBC, Dr. Kishore Shallow. “We are pleased to be associated with the development of youth cricket in the Windwards through our partnership with the WICBC, with whom we have developed a good working relationship over the years. We have seen the success and are proud of our youth cricketers from these tournaments, many of whom have gone on to play for their senior national, Windwards and West Indies teams, and urge the public in the islands to continue to support them, by playing our Super 6 game. ” says WINLOTT Inc representative Ms. Allison Thomas. Acting CEO, WICBC, Dwain Gill also echoed the significance of this contribution. “WINLOTT Inc. has once again showed its commitment to the development of our next generation of cricket stars in Dominica, Grenada, St. Lucia, and St. Vincent and the Grenadines. We are confident the investment in our youngsters will bear fruits in the not too distant future,” said Mr. Gill. The December matches will see the four islands playing in a double round-robin format where each team plays the other twice in 50 over matches. At the end of the tournament, a Windward Islands Under 15 team will be selected for the April 2018 CWI Under 15 tournament. Last year saw Grenada U15 team emerging the winner of the tournament. Last year, based on their performances in the WINLOTT Inc/WICBC Under 15 tournament, and on the Windwards U15 team in the CWI Regional U15 Tournament, players, Ackeem Auguste of St. Lucia and Yawani Regis of Dominica, were selected for the CWI Under 16 team which toured England in August 2018. Emmanuel Nathan, President of the Windwards Islands Cricket Board of Control, cites WINLOTT Inc’s contribution as invaluable to young players’ development and success. “We are very proud of our guys and the level of sportsmanship they display. The patronage of WINLOTT Inc afford our young players the opportunities for success. On behalf of the board I want to express our gratitude to WINLOTT Inc. for their commitment to Windward Islands cricket and the development of our youth players,” he stated. WINLOTT Inc also sponsors the Windward Islands Under 19 tournament, and since 2015 has contributed over $940K to both Windward Islands Under 19 and Under 15 tournaments, and by covering costs for training camps ahead of CWI regional tournaments. The company also sponsored the Windward Islands T20 Tournaments from 2010-2013. The general public in St. Lucia is encouraged to attend the matches to support and motivate the young players. We can all invest in the development of the youth cricketers by playing Winlott Inc’s Super 6 lotto game. This is an official media release of the St. Vincent & the Grenadines Cricket Association Inc.